Whether it's to prevent piracy or due to iOS file system limitations, downloading mp3 and wav files on an iPad or iPhone is incredibly stressful. So here I run through a simple solution to enable you to download these files from websites. Needless to say Apple have made it rather difficult to download MP3 files from a website. Luckily with this technique and a little patience we can download any mp3 file or mov file onto our iOS device. If you are like me and you love using Discord to chat to your friends but find the lack of console support an issue video aims to help. I will teach you how to use one headset with both your PC and your console. Firstly we will need a headset that has an optical and a USB connection. In this example, I will be using the Astro A40 TR's. To start with you'll need to connect the supplied optical cable to the input at the back of the mixamp and the other to your PlayStation. Once you have achieved this you will need to head to your settings, click sound and screen, and change the audio output to optical. For more information on this click this link to see Astro's setup video. Next, we will plug the USB cable into your computer and the mixamp. Once you have plugged in your USB cable, click and hold the power button on your Astro Mixamp for until the lights turn completely white. This signals that you are in PC mode. Now head to discord, click settings and click voice. Change the input device to your Mixamp. You will also need to set your output, for now, I will leave this as default. Now your Astro A40s are picked up through discord, but audio is not transferred to your headset. To fix this, you will need a 3.5mm to 3.5mm cable that you will need to plug into your speaker output on your PC and then into the 3.5mm AUX jack on the Astro A40 TR Mixamp. 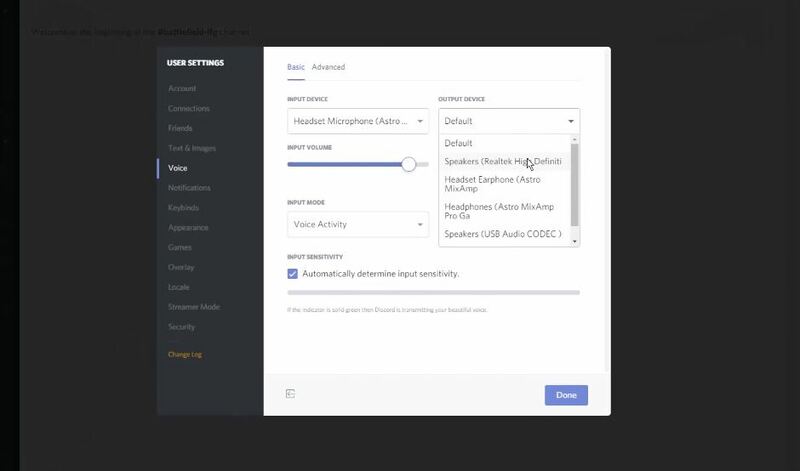 Now head back to the voice settings in Discord and change the output to your speaker port, by default this is usually "Speakers (Realtek)". And there you have it, you can now use Discord for communication and the PlayStation for gaming at the same time. How do I Stream on Twitch? Streaming to Twitch is incredibly simple, all you need is a fairly modern computer and OBS. Obviously, the more powerful your PC, the better your stream will look. Using OBS isn't just limited to Twitch, you can also use OBS to stream to YouTube, Facebook, Mixer, and more. If you want to go one further, you can use a two PC setup, this will allow you to have one PC to capture footage and encode it to your streaming platform of choice and the other primarily focused on your content. To use this method, you'll need to use a capture card. Below is a straight to the point video tutorial on how to stream with OBS. Everything you need to get going is in this video. I hope you enjoy it. So if you're a PC gaming, a console gamer, or a creative who wants to stream their activities on Twitch, you'll want to watch. If you want to stream to YouTube, Mixer, or Facebook you'll need to find your access/stream key on their respected websites. Thanks for taking the time to watch the video. I'd greatly appreciate it if you could visit my YouTube channel and like, comment, and subscribe for more content. My YouTube channel has a variety of content from my previous years filming BMX professionally, gaming videos, tutorials, andother projects. Alternatively, you can follow me on Instagram for daily rambles and photos by visiting http://www.instagram.com/chriswilmshurst. If you'd like to see more content like this, please leave a comment on the video and I'll make sure to produce more.